Hohensalzburg Castle literally dominates the skyline of Salzburg. It’s a vast, mighty fortress, seated upon the Festungsberg mount – a rocky crag which rises hundreds of metres above the city. 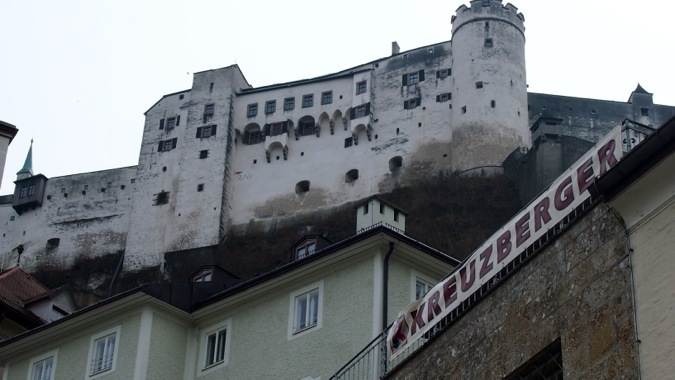 The fortress is a dramatic contrast to the delicate streets of Salzburg’s Altstadt, which weave gently below it. Hohensalzburg was founded back in 1077, and gradually evolved into one of Europe’s largest fortresses. It’s an impressive site – it measures around a quarter of a kilometre in length, and is surrounded by vast curtain walls. Perhaps as a result, the fortress was never seriously threatened by military force. Inside the castle today, you’ll discover quite a variety of things to see – including a Museum of the City, a Museum of Puppetry, and an understated little Romanesque chapel belonging to St George. Most visitors come for the spectacular views across Salzburg, which reach out to the Austrian Alps beyond. Salzburg Castle was built by a succession of the city’s archbishops – beginning in 1077, under Archbishop Gebhard von Helfenstein. The early purpose of the castle was to defend the city – but it had a role in aggrandising papal power. Initially, the fortress was designed as a simple bailey. However, significant fortifications were added in 1462, when Cardinal Burkhard II added the mighty curtain walls and many of the towers to the castle. View of the Medieval windows and towers of the castle interior, looking down from the Rekturm tower. In the 1500s, the castle began to take its modern shape, and gained a very strange coat of arms – depicting a lion holding a turnip. There are two explanations for the choice of vegetable: and both relate to Archbishop Keutschach, who commissioned the construction of much of the fortress between 1495 and 1520. The shield of Hohensalzburg Castle – note the unmistakeable turnip design! According to popular legend, the turnip symbolises the an important moment in Keutschach’s life: when he was a boy, he shied from working in the fields, which prompted someone to lob a turnip at him. It’s said that the turnip knocked him on the head – and knocked some sense of social responsibility into him. It’s a nice story, but it’s more likely that the turnip represents the agricultural heritage of the Keutschach family. Nonetheless, the archbishop really shaped the fortress – both strengthening the lower fortifications, and extending the upper levels into more genteel state rooms. Archbishop Keutschach was also responsible for building the incredible Burg Hohenwerfen, which is less than an hour from Salzburg and definitely worth a visit. Interior decoration of the castle, depicting Archbishop Keutschach – who was responsible for so much of the castle which we see today. The strengthening of fortifications came in useful in 1525, when the castle was besieged for the first (and last!) time – ironically enough, by the townspeople of Salzburg, who were aggrieved with their present archbishop. Although the castle survived that siege, it gave itself up without so much as a squeak when the Napoleonic wars broke out in 1800. The fortress – perhaps wisely – passed into the hands of the French, and was later used as a military barracks and dungeon. As you can see, the castle fronts onto a sheet cliff-face, facing the town. I can’t imagine storming these walls too easily. . . If you’re exploring Salzburg, there are two ways to reach the castle. You can scale the hill by foot (which’ll take a bit of effort), but many visitors choose to let the train take the strain and travel via the funicular railway. The rails of the funicular, which connects the castle to the city below. A form of railway has connected Salzburg Castle with the city for literally hundreds of years. A very basic version was running in Medieval times – helping ship building materials to and fro – but the modern track runs along a line built in the late 1800s. The line was constructed to help ferry tourists to the site – visiting since Emperor Franz Josef opened the gates in 1860. Modern visitors are confronted with a choice of two different tickets to enter the castle – either a general entrance ticket, or a ‘complete’ ticket, which includes the general entrance fee, plus the ride to and fro using the funicular railway. Once you’re through the door, all the different sections of the castle are included in the main price. Light streams through a formidable Medieval window within the castle. You’re quite free to wander the internal courtyards of the castle, exactly as you please: although the massive curtain wall blocks out much of a city view, the gates and connecting courtyards are a pleasant enough place to hang out. You can tour the majority of the fortress under your own steam, but some of the more impressive sections of the castle (the Golden Hall and Rekturm Tower) must be explored using an audioguide. The Rekturm Tower, in particular, has spectacular views of Salzburg. One of the interior rooms of the castle that’s accessible on the audiotour. The audioguide provides some context and history to the site, and takes you past the famous Salzburg Bull – a 200-pipe organ that dates back to about 1500. The spire of St George’s Chapel – one of the buildings inside the castle courtyards. When you’re not poking your nose into St George’s Chapel, or one of the museums inside the castle, you’re free to wander through the castle courtyards. The castle courtyards would once have been a hubbub of Medieval life: filled with blacksmiths and breweries, knights and tradesmen. In fact, they would have contained a little microcosm of Medieval society, helping the castle remain self-sufficient under siege. Nowadays, they’re much quieter places: studded with ancient lime trees which rustle in the wind. The castle could have been self-sufficient in a state of siege – as this evocative well demonstrates. From the courtyards, you can explore a number of attractions, all included in the main ticket price: there’s definitely room for improvement with some of these, but they warrant a bit of time. Within the fortress, you’ll discover the Salzburg Marionette Museum. It’s an unintentionally creepy exhibition of historic puppets collected from the famed Salzburg Marionette Theatre. The theatre company is one of the city’s most famous exports – it’s been going since 1913, enacting productions of Mozart opera and the like. Nowadays, you can explore a couple of rooms of frankly unnerving marionettes, and also have a go at puppeteering yourself. To battle! An effective display of armour within the castle museum. The Salzburg Castle Museum is another sizable, free museum contained within the castle walls. 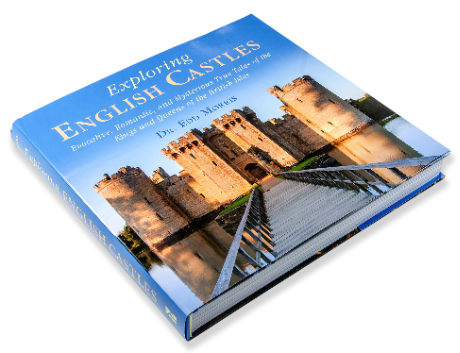 It includes authentic items and excavations from the castle’s past – everything from Roman gold coins, to Medieval weaponry. It also encompasses some of the grander Medieval state rooms, with studded gold stars against deep blue ceilings. If you’re interested in modern military history, the (rather dated) ten rooms of the Rainer Military Museum tell the story of the Salzburg Regiment – which lost more than 5,000 men during WWI. View from the central Rekturm tower, looking across to the snow-capped Alps. If you’re planning a trip to Salzburg itself, then you should know that it has two big claims to fame: it’s the birthplace of Mozart, and it’s also indelibly linked with The Sound of Music. If you’re interested in Mozart, his birthplace is (very clearly marked!) in an old building on Getreidegasse Lane, which is nowadays a quaint alley pricey boutiques in the heart of the city’s Old Town. Every tourist in Salzburg enjoys a vast slice of Sacher Torte with a generous swirl of cream – the cake’s a little bit too dry otherwise. Most visitors leave with the impression that Salzburg’s a remarkably pretty little city, with a beautiful Medieval old-town that extends across the two banks of the Salzach river. What’s even more pleasant is that you can definitely feel the fresh mountain air in your lungs. Be warned that it can feel over-touristy, though, and it’s certainly pricey. But even so, there’s an atmosphere which you won’t want to miss – the beautiful old town is filled with winding streets and delicate cafes, all of which serve massive portions of Apple Strudel with vast frothy coffee. If you’re interested in exploring other castles of Austria, you shouldn’t miss the spectacular Burg Hohenwerfen – just a quick daytrip from Salzburg, and a truly magnificent fortress. Another recommended adventure would be to see the spellbinding 14 gates of Hochosterwitz Castle, which is about three hours from Salzburg, and one of Austria’s most amazing castles. Hohensalzburg Castle dominates Salzburg. Discover its secrets - and uncover dusty old legends. Filled with photos and old tales.